by Sarah Sutton, Scott Bruton, Sapphire Halliday and Daniel Porter. More than 160 enthusiastic participants braved Victoria’s cold winter to participate in the annual Cattle Handlers’ Camp, held at the Melbourne Showgrounds, Ascot Vale, between 10 and 13 July 2017. The camp, first held in 1988, is conducted by Stud Beef Victoria. Its purposes are to ensure that succeeding generations of stud grooms are properly educated in the skills and responsibilities of stud grooming and showing. The camp includes a wide range of educational activities, taught by experts. The commercial side of cattle breeding, as well as showing, is explained. The culmination of the camp is a cattle show. It includes a competition for paraders. This year, the age of participants ranged from eight to sixty plus. Skills also varied, with experienced stud owners at one end, and novices enjoying their first show at the other. Eighteen very keen juniors worked with Beef Shorthorn and Australian Shorthorn cattle provided by Scott Bruton, ‘Roly Park’, David Ashley, ‘Morningtime’, Shelley Jepsen, ‘Shambra Park’, and Darcy Swan, ‘Swanlea’. Scott Bruton’s effort in bringing forward 14 cattle was fantastic. The eighteen young handlers were Luke Cornfoot, Rachel Duggan, Rhys Farrelly, Zoe Fehlberg, Danielle Greene, Benjamin Harman, Paris Hourn, Lucy Kell, Mitchell Lollback, Isabella May, Seth Neutze, Corey Pike, Zach Robertson, Sarah Sutton, Hope Wheaten, Xavier Wheaten, Adam Wilkie and Ruben Wijsman. The great temperament of shorthorns was very evident. Many novices were set to work handling, grooming and caring for animals which were not previously known to them. The handlers learnt new skills and gained confidence. A number of them went on to win ribbons in both the animal and parader classes. In the cattle judging, Paris Hourn paraded Morningtime Kiribati’s Blossom 4, first in her class. In the parader classes, where handlers were graded according to their level of experience, Zoe Fehlberg and Paris Hourn placed second, and Rachel Duggan and Ruben Wijsman placed third. Everyone who participated thoroughly enjoyed the camp. 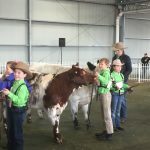 They made new friends and gained skills which for many will be put into practice at this year’s Royal Melbourne Show and during the Spring show season.